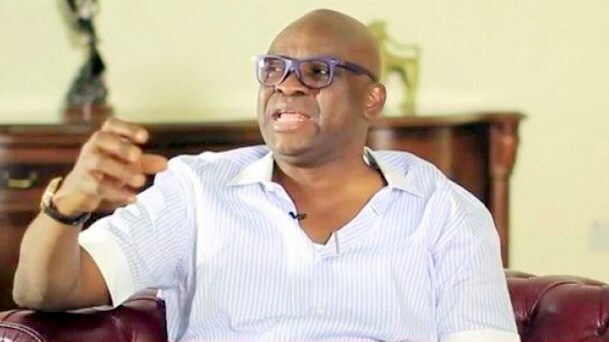 A non-governmental organization, Ekiti Development Front (EDF), has said it decided to embark on aggressive empowerment of Ekiti indigenes to break the hard-biting poverty and culture of beggary brought by Governor Ayodele Fayose to the State. The Coordinator of the humanist organization, Barrister Adeoye Aribasoye, said no fewer than 150 Ekiti residents had been empowered in various fields of human endeavour in the first phase of the empowerment programme held in Ado Ekiti. He said the beneficiaries received cash gift, Sewing Machines, Dryers, Compressors with complete engine for vulcanizers, and washing machines, grinding machines, Generators, Clippers, Cake mixers, Food stuffs – and social interventions like, Day old chicks and feeds, among others. Speaking at the second phase of the empowerment held on Saturday in Ikole Ekiti, Aribasoye bemoaned how Fayose had successfully turned Ekiti into a beggarly state, describing this as a failure of governance. Beneficiaries at the event got washing machines, sewing machines, stoning machines for fashion designers, and grinding machines, hairdressers, compressors/engines for vulcanizers, filling machines for shoe makers, generators, Day old chicks with feeds. Aribasoye added that 24 families in the State have been placed on safety net of Social Security Scheme, where food stuffs will be made available at food banks established by the body to reduce famine. Aribasoye stated the agenda of the organization is to empower citizens, assist them in fighting for their rights, and in mass political enlightenment for the populace. On how to improve scholarship in the State, Aribasoye said the body is resolute about establishing a robust scholarship scheme to help in defraying school fees of those that have challenges, urging Ekiti residents to obtain application forms for the programme to begin. Aribasoye said that the movement is not political but personal effort targeted at backing political aspiration of anybody that the organisation is convinced of having good mission, vision and developmental agenda that will better the lives of the people. “We at EDF are ready to support anyone or group of persons interested in the development of our society. We shall not be deterred or lose focus on this”, he said. He disclosed further that these passion and qualities were what the organisation saw in Dr. Fayemi which was why they are supporting his ambition because, “we have no doubt that if he wins the July 14, 2018 governorship in the State, he will restore he will ensure better life for the people of Ekiti”. “This empowerment program by EDF will by the grace of God run weekly from now on for the next two months and on monthly. “You may ask why now, to every destination there must be a step, that step must be taken at a particular time and that step has been taken now and we won’t stop until we reach our destination and by the grace of God we shall get there. “You may further ask, why then using same to support Dr. Kayode Fayemi? Kindly note, I have never hide my preference for JKF since 2005 I first heard about him. I have a strong conviction about his person and what he stands for. “I saw his programs in his first tenure as governor of Ekiti State and I saw a man with passion for development in all ramifications. He is a man that sees tomorrow. His programs for the senior citizens by payment of ‘owoarugbo’ endears him to me just like other legacy projects in Ekiti State and I believe he can still do more. His visions are in tandem with EDF vision and objectives. “We will continue to build men, to teach our people how to fish by supporting them in the areas of their skills. “I see a better Ekiti where sufferings will be reduced, a society where we will understand that the greatness of a man is not in the amount of wealth he acquires but in the number of lives he is able to affect positively”. One of the beneficiaries, Mrs Cecilia Arije, saluted the courage of the initiator, saying : “this will motivate us to further support Dr Fayemi and APC in the July 14 election. “Fayemi worth being reelected, because he was able to reduce poverty by his Social Security Scheme, where 25,000 elderly above 65 years were getting N5,000 monthly stipend. This really helped in stemming the tide of poverty in Ekiti. “But today, nothing is happening at the grassroots, Governor Fayose had abandoned us”, she said.